Explore the art and making of Guillermo del Toro’s new masterpiece, The Shape of Water, now nominated for thirteen Academy Awards, including Best Director and Best Picture. 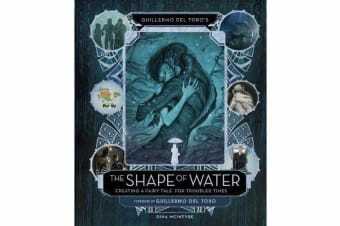 From master storyteller Guillermo del Toro comes The Shape of Water-an other-worldly fairy tale set against the backdrop of the Cold War-era United States circa 1962. In the hidden high-security government laboratory where she works, lonely Elisa (Sally Hawkins) is trapped in a life of silence and isolation. Elisa’s life is changed forever when she and coworker Zelda (Octavia Spencer) discover a secret classified experiment. Rounding out the cast are Michael Shannon, Richard Jenkins, Michael Stuhlbarg, and Doug Jones. Guillermo del Toro’s The Shape of Water: Creating a Fairy Tale for Troubled Times chronicles the entire filmmaking journey, from development to design to filming. Featuring interviews and commentary from key actors and members of the creative team, the book also showcases the amazing concept art and design work created for the film. For del Toro fans and movie lovers everywhere, it’s the perfect way to explore this exciting new movie from a master filmmaker known for his poignant storytelling and visual grandeur.